A sawmill that was established on the Zuni Pueblo Reservation in western New Mexico in the early 1900s as part of a conservation initiative intended to restore damaged forests of ponderosa pine and juniper. Selected biomass was to be removed from the forest, allowing the silvicultural management of a sustainable timber resource whose proceeds would benefit the tribe. Today the modernized sawmill is known as the Pueblo of Zuni Forest Products & Services, a logging enterprise that operates in collaboration between the Zuni Department of Natural Resources and the Cibola National Forest, with the purpose of maintaining healthy forests on Zuni lands and providing timber for homes that are built on the reservation. 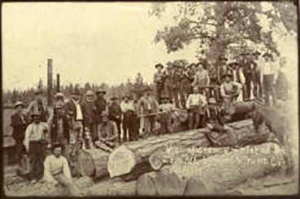 "Employees of the Zuni Mountain Lumber Company sawmill, New Mexico, circa 1890," photograph, (130764). Palace of the Governors Photo Archive, New Mexico History Museum, Santa Fe, NM. All rights reserved. Use with permission only. Natural Resources, University of California, Berkeley.